Church Stores is a family owned company with an extensive history of providing the best supplies for Australian churches. The first store opened in the Queen Victoria Building in Sydney in 1904. Over the century that followed, with Sydney as head office, we have operated branches in Brisbane, Perth, Adelaide and New Zealand. In recent years, modern technology has made it possible to service our customers both local and distant from the one retail outlet in the Dymocks Building in the Sydney CBD. Three generations of family members have managed and worked in the company since its inception, and we are still owned and managed by the same family. Church Stores is open to the public and we are enthusiastic about old fashioned personal service. We are keen to meet you and to discuss your questions and requests. 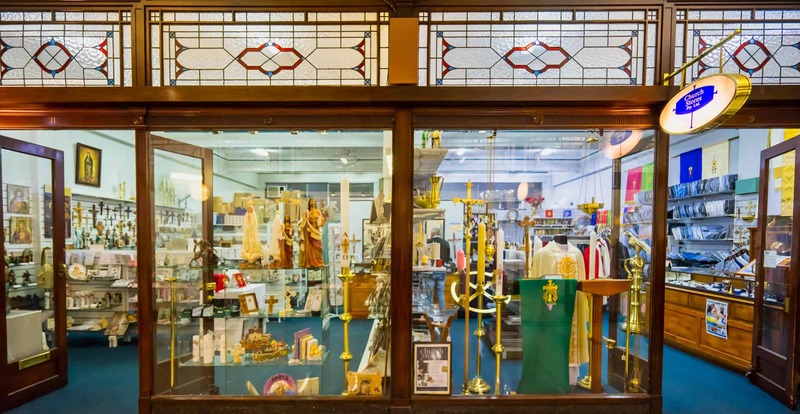 Customers who visit our shop will benefit from the best access to the staff for advice, and they will find the full collection of Church Supplies on display. We offer service and advice, and we take orders over the phone or email. Further, a selection of the most popular products are available for purchase from our online shop. We are your go-to provider of Church Supplies and Christian Gifts. Our collection of Clergy Shirts is outstanding in Australia. As the official Australian supplier of Hammond and Harper Shirts from England and Black and Purple Shirts from Poland, we have the best chance of providing a satisfactory fit. On our wall of shirts, we carry in stock various styles of clerical shirts in various colours and sizes, all made of high quality materials. Situated in our Sydney shop is Church Stores Studio, our Vestment-Making space. Vestments (such as Stoles and Chasubles in liturgical colours), Albs in various sizes and surplices are available in stock off the rack. 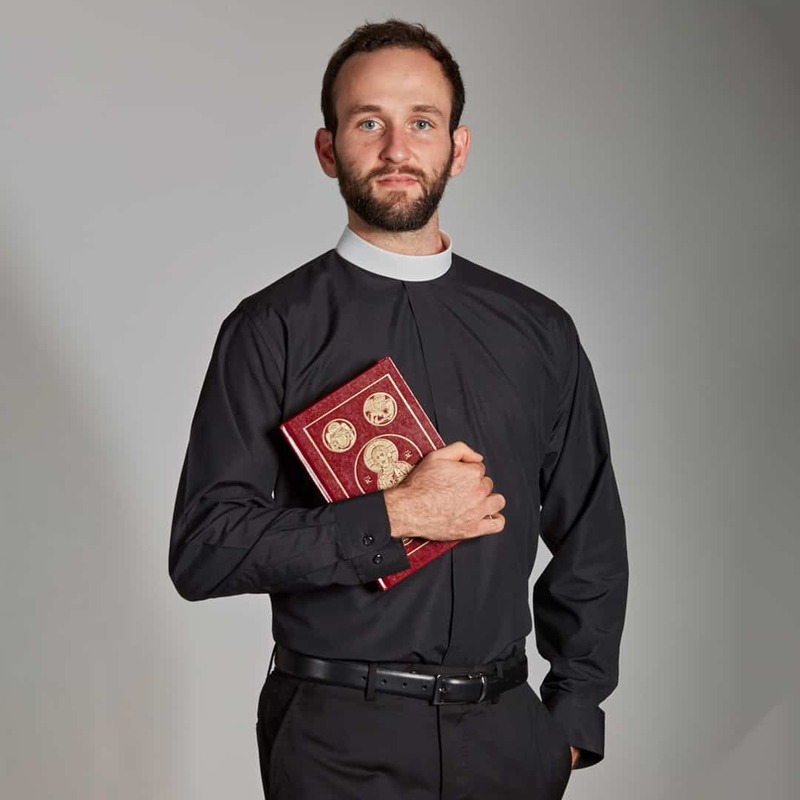 We offer clerical tailoring for Cassocks and Soutanes. And we would love to hear from you about any special projects you have in mind. Vestment-making specialists are on hand to discuss commissioned work and restoration of old vestments. The beautiful Ecclesiastical Brocades, Fabrics, Lace and Trims that our vestment-makers use for their work is also available for sale. We carry a full collection of Church Supplies, such as Altar Breads (or Communion Wafers), Church Incense made by the Benedictine Monks of Prinknash Abbey in England, 3 Kings Charcoal and Church Candles. Some of our customers collect these items from our shop in Sydney, but most of our customers order these items for dispatch anywhere in Australia or overseas. There are many little items needed in a Church, such as cruets, Asperges Bowl and Sprinkler, Bells, Alms Bags, Lavabo Bowl and Jug, just to name a few. We carry these items in stock. As the exclusive retailer of W J Sanders products, Church Stores holds in stock some of the best quality Church Brassware and Silverware in the world. Made in Sydney, Australia, W J Sanders Thuribles, Chalices, Patens, Ciboria and candlesticks are known for elegantly simple designs made to perfection by traditional methods of craftsmanship. Additionally, we source some of the best quality and best value furnishings, fittings and textiles of European manufacture from our network of international suppliers. As a family business, not affiliated to any particular Church, we have a long history of supplying the books and publications used by the major churches in Australia. We specialise in Catholic Publications (particularly the Roman Ritual books), Anglican Publications (AAPB Resources) and Uniting Church Resources, as well as Church Certificates and Registers. We stock bibles, specialising in NRSV and King James editions. In fairly recent times, we have developed a famous collection of religious gifts. We have one of Australia’s biggest collections of Communion, Confirmation and Baptism gifts, as well as rosary beads, statues of Jesus, Mary and the saints, religious jewellery and other elegant gifts all of exceptional quality. We endeavour to keep in stock all the necessary things for a Christian Church and a Christian Home, and offer attentive, knowledgeable service. After more than a hundred years of business, Church Stores remains… “At your service”.